Now that local sugar pumpkins are on sale, I've been trying to store them up in the freezer. Of course, I cook it first! Just cut one in half, scoop out the seeds, and roast it cut side down until it's tender. After taking it out of the oven, let it sit and cool for a while. Then the skin peels right off. Basically, it's a such a little bit of work for so much return. I ended up with 6 cups of purée from this medium-sized pumpkin. And it freezes beautifully. I put it in ziploc bags in 2 cup amounts. But what to make with all this lovely pumpkin purée? Pumpkin Ice Cream: I've been craving this lately and who to turn to but David Lebovitz? Pumpkin Ricotta Gnocchi: I love gnocchi, and each winter I make a squash variety with a sage browned butter. I usually use the Joy of Cooking's recipe as a guide. But this one featured on Simply Recipes by Hank Shaw looks like a winner. Pumpkin Granola: When I made Quinoa-Nut Granola, Kaela from Local Kitchen said she was going to try it with pumpkin instead. I like that idea! (I think she made pumpkin beignets the other day…hmm) And then that makes me think of these Pumpkin Butter Oats from Food In Jars. There's pumpkin bread, pumpkin custard, pumpkin pie, of course. Pumpkin purée (or squash purée) is always good in mac and cheese. Pumpkin soup. What are you making with your pumpkin (or squash)? Julia, do you have to drain a lot of liquid off before pureeing? I like all your suggestions very much! I also enjoy pumpkin puree in risotto, and made into soup. I don't, Laura. Do you? I find that the purée seems thick enough. Pumpkin risotto is a fabulous idea! I just drained off almost 2 cups of liquid from the pumpkin I roasted. Maybe it's the type? Wow, that's a lot! Must be the type. I gave mine a closer look, and it didn't have much liquid pooling in it at all. 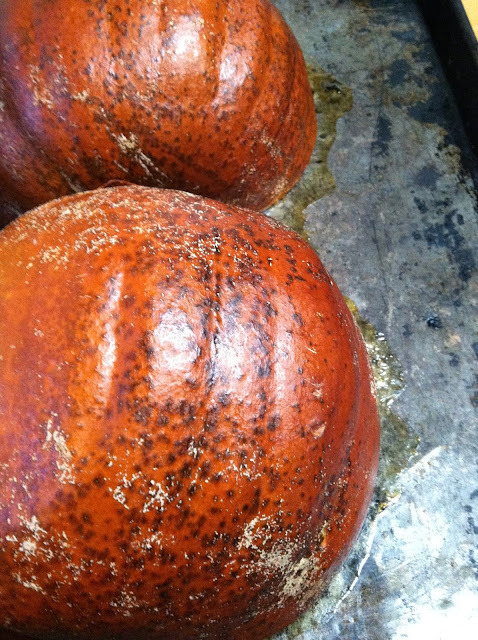 I was just looking at the sugar pumpkins yesterday. There's a grain/dairy/sugar free pumpkin pie (nut crust) in Breaking the Vicious Cycle that I like a whole lot, even if it doesn't really hold together like a pie. It's more like a custard -- but that's all good. Also, I'm going to try that granola . . .
Shae, I like making a custard in little ramekins. It's actually easier than pie, but a nut crust sounds amazing. Is your diet still really strict? I need to know! One of the local bakeries makes a pumpkin ginger cheesecake. I love pumpkin cheesecake. Maybe I'll try one!